Take advantage of the upcoming long weekend, in honor of MLK Day on Monday. Choose one of these five cities for a fabulous last-minute getaway! If you are looking to let loose over this year’s long MLK weekend, stick with a classic like Vegas! 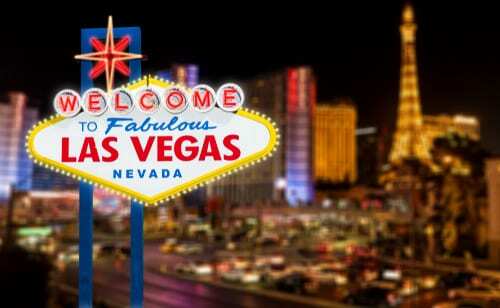 Plus, does anyone really ever want to be in Las Vegas for more than 3 nights max? That’s plenty of party time, in our opinion. Anyways, even if you are interested in Las Vegas for leisure rather than partying, a 3-day weekend allows plenty of time to really soak in this long weekend destination. Whether you are looking for relaxation or a wild escape, we suggest you head to The Mandarin Oriental Las Vegas. Here you’ll find one of the most peaceful spas in town, plus it is very centrally located in the center of the Strip. Of course there are plenty of other great options to choose from, like Palazzo, The Cosmopolitan, Caesars Palace, and many more. Kansas City is one of the most underrated cities in the America, and it is the perfect long weekend road trip destination for our fellow Midwesterners. One of the best things to do in this fab city is eat! And if you are a barbecue fan, then you;re in luck. Kansas City is home to some of the best BBQ joints in the world. Some of the best include Joe’s Kansas City Bar-B-Que. Don’t leave here without sampling a big slab of ribs, with plenty of homemade BBQ sauces to choose from. If BBQ isn’t your thing, KC also has some of the best steak in America (not as good as Omaha, but what city is?). For a juicy steak, head to Anton’s and get the butchered-to-order bone-in filet. More interested in the drinks than the food? Book a brew tour at Boulevard. Lastly, make some time to see a jazz show at the Green Lady Lounge. Washington, DC is another foodie-friendly long weekend destination! Instead of BBQ, however, DC is known for having some of the best Ethiopian restaurants in the country. A good spot for Ethiopian beginners is Dukem, located on popular U Street. You can’t go wrong with anything you order here! We love DC because you can have an amazing long weekend here without spending a lot of money. You’ll find tons of budget-friendly restaurants and free things to do, like some of the best museums in the country, plus plenty of famous monuments and memorials. In addition, DC has one of the best botanical gardens and the National Zoo. If you are looking to get away somewhere warm during this January long weekend, consider St. Petersburg, Florida. There is so much to to here, so it is the perfect destination for a family or a group of friends with eclectic tastes. The food scene is absolutely exploding here, and of course seafood is the main focus in this beach town. Besides fantastic seafood, St. Petersburg is home to Fort De Soto Park. Here you will find one of the best beaches in Florida. Clearwater and Siesta Key are also nearby, with impeccable beaches. You’ll even find a great Dali Museum here! Charleston is one of the most beautiful cities in America. This long weekend getaway destination is the perfect place to visit during January because it is way too hot in the summer months. Take advantage of the gorgeous winter weather this weekend! Be sure to visit King Street, the main drag of gorgeous homes, cute shops, and trendy restaurants. Besides King Street, Charleston has much more to offer visitors. We suggest spending a day at Battery Park, down at the peninsula’s point, taking in the view of Fort Sumter, and exploring the city’s century-old oak trees. Then head east to the water for a gorgeous view of the famous Ravenel Bridge from the warehouse district. The warehouse district is one of Charleston’s up and coming neighborhoods, where you’ll find tons of restaurants and places to stay. Call us today to book your own long weekend getaway! You can reach us at 402-390-9291.